Tarell Alvin McCraney’s production plays out on an elegantly sparse set of Roman columns and arches, flagstones below and a canopy above. There are pools of water but we are only aware of these when the actors trample through them or bathe in them. The setting seems to be the Caribbean during the slave trade. The Romans are dressed like Horatio Hornblower, and the Egyptians are the African slaves, for this culture-clash, this demonstration of imperialism. 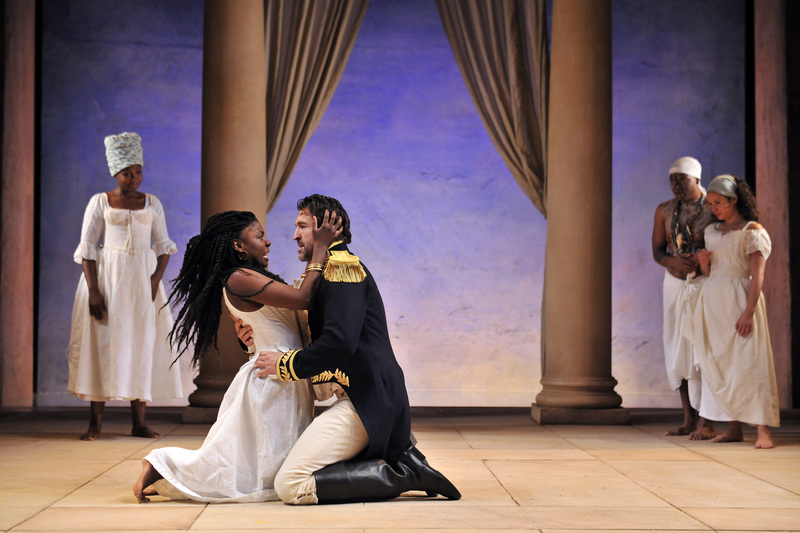 As Cleopatra, Joaquina Kalukango is hot-headed and capricious, wilful and passionate. She is petite but imbues her Queen of the Nile with a dignity and presence that belie her diminutive stature. Jonathan Cake is her Antony, towering over the rest of the cast, a bombastic, swaggering egotist. It’s difficult to see what Cleo sees in him, apart from his dashing good looks. He is the kind of man who would use ‘party’ as a verb. Samuel Collings is excellent as a bit of an uptight Octavius, a stick-in-the-mud in contrast with the good time guy Antony. Like Kalukango, he gives his character a haughty, entitled air, and delivers emotion both restrained and unfettered, when the need arises. Chukwudi Iwuji’s Enobarbus is appealing although, a little oddly, he announces some scene changes, but not all of them. At the end (spoiler!) he comes back as a Baron Samedi figure, leaping and prancing, as Death joins the party. I think there is more scope for Voodoo in this setting – we get a glimpse of a doll early on. Chivas Michael provides touches of comic relief and some absolutely beautiful singing, plaintive and evocative. There is also strong support from Sarah Niles and Henry Stram in various roles. On the whole, it works rather well, attractive to the eye and easy on the ear. But I couldn’t buy into the central relationship, the doomed love story, mainly because of Antony. Too headstrong and cocksure (and vice versa, probably) he struts and frets but as a lover, doesn’t convince.